SO anyways, in my last serious talk post I was telling you all about how I’m really struggling with my anxiety lately and have been dealing with some nutty hearing hypersensitivity. Well, I still am. And it’s not an overnight quick fix. It developed slowly and my anxiety as I described in depth has been present for years. I’m working on it. There are good days and there are not so good days. There are times when I’m in class and want to walk out the door because someone is chewing gum or making some strange bodily noise. But it hasn’t happened yet this semester and I’m taking that for a win. By this time last semester I had dropped two courses. I’m currently in five and I’m managing five. I like the word managing. It’s like saying “I’m handling my struggles to the best of my capabilities”. I’m not pretending they aren’t there because they most definitely are present daily. I’m also not allowing them to completely rule my life, because if that were the case I’d be living inside a giant real-life bubble. Lately it’s learning how to be flexible in my ways. Sure I might not want to discuss my struggles and needs for accommodations with my profs for their classes, but it is pretty much essential for my success this semester. Therefore I have already met with two of them and to my surprise, both of them were rather understanding and open to helping. I think that when we are honest with ourselves, and able to be honest about ourselves with others, the world seems a little less scary and things seem to flow a little bit better. After last semester didn’t go as planned I knew I needed to find a way to get by. Part of the reason I think it was so rough was because while I knew there were things that needed attention and to be worked on, I wasn’t ok with being open and forward about them. I wasn’t ok with accepting that I still had a lot of self-work to do to get to a place where I am able to roll with the punches. I’m still not there, but accepting that is helpful beyond measure. Staying positive is the best method of action and helps keep your head in the game. The following quote is also helpful beyond measure. 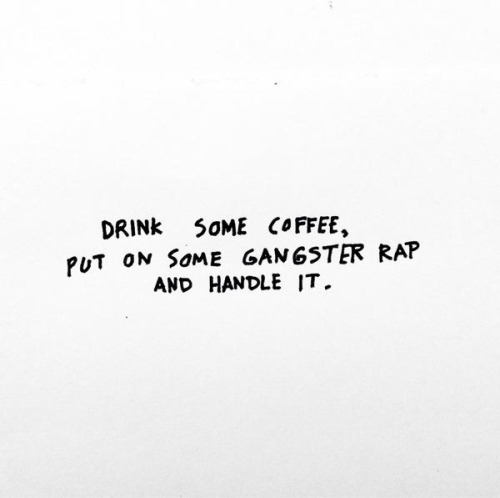 I’m being serious, coffee + rap = recipe for success. Give it a go. Let me know how it goes. For me, right now I’m focused on living as normally as possible. I’m working to keep my cool even as my stress will undoubtedly increase as the semester continues onward. I have my strengths and I definitely have my weaknesses, but part of lifting myself up is accepting that having weaknesses isn’t a bad thing. I’m dedicating this period of the next few months to the pursuit of bettering myself, wherever that ends up taking me.